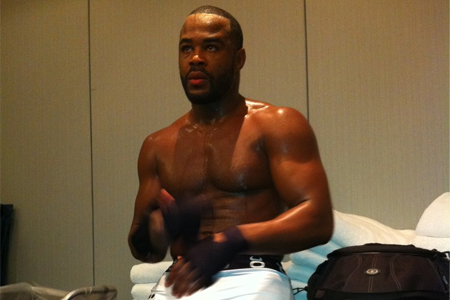 If you happened to skip Saturday night’s main event between Rashad Evans (Pictured) and Phil Davis, you certainly didn’t miss too much. Nonetheless, FOXSports.com has provided the video highlights for your viewing pleasure. Evans posted a lopsided unanimous decision victory over “Mr. Wonderful,” sweeping all five rounds on the three judges’ scorecards. Although his victory was convincing, “Suga” wasn’t completely thrilled with his performance. The former champion admitted at the post-fight press conference that he failed to capitalize on several opportunities throughout their 25-minute affair. Regardless, Evans advances to challenge bitter rival and reigning king 205-pound Jon Jones for his crown at UFC 145. BTW, “Bones” was in the house to scout his impending opponent first-hand. “UFC on FOX: Evans vs. Davis” took place inside United Center in Chicago, Illinois.